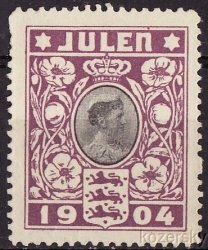 Denmark 1, 1904 Denmark TB Charity Seal, VF, NG. Worlds 1st TB Charity Seal, issued 1904 with image of Queen Louise. Denmark 1, 1904 Denmark TB Charity Seal, VF, NG. Great centering, clean, No Gum. Scan of front and back available upon request. Issued by the Danish National Society Against Tuberculosis. Cameo of Queen Louise; typographed; Colors: violet & black; perf. 24x30mm.